of the last of summer's bounty! As summer draws to a close we were fortunate to find a few left over zucchinis hidden among the yellowing leaves. 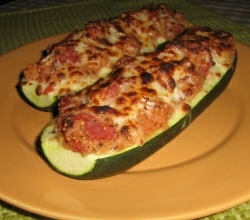 We decided to make stuffed zucchini boats. Filled with healthy stuffing, smothered in mozzarella and baked, these zucchini make for a satisfying evening dinner. Add the vegetable broth to a medium saucepan and bring to a boil over medium-high heat. Add the cous-cous to the broth, remove from heat and allow the broth to be absorbed. Once the broth is fully absorbed return to a medium heat and add the diced tomatoes, onions, parsley and Italian seasoning. Allow it to heat through. Meanwhile, pre-heat oven to 400°F. Slice the zucchini in half and scoop out the center with the seeds. Baste it with a small amount of olive oil and set it in a small baking pan that has been lightly rubber with oil or sprayed. Once the cous-cous mixture is heated through, scoop it into the zucchini halves and mound it up. Place in oven and bake for about 20 to 25 minutes, until the zucchin is tender. Remove from oven, sprinkle generously with vegan mozzarella and place under the broiler for several minutes, being careful to brown but not burn the cheese. Remove and serve immediately with your favorite sliced fruit sides.